Devonport runner, Matthew Greenhill, has broken through for a win in the Sea Lyons Swim School 6 kilometre handicap at West Beach on Sunday. Starting one of the favourites after many good performances during the latter half of the year, Greenhill savoured his second victory with the Club, his first being a 5 kilometre event at Ulverstone in 2012. Greenhill was a former top local tennis player until a back injury prevented him from continuing. He now stays fit training with the Meercroft Park group as well as participating in other physical activities, such as ocean swimming, with his family. Greenhill overtook gallant front marker, Louise Morse, with just 100 metres to run who just hang on to beat Richard Lawson who showed some late season form to finish third. Other top performances were recorded by Lorraine Shepheard and Rebecca O’Garey. O’Garey finished fourth and was fastest female (24:23). Fastest male was Thomas Wilson who charged home recording a slick 21:04. Raymond Spinks on Sunday achieved a unique milestone. He has run 270 successive races (10 years) without missing a race. At 75 years of age, Ray has run a total of 1030 races and should add considerably to this total before he hangs up the running shoes. Nominated time winners were Jemima McLaren, Chloe Bates, Amber Taylor and Piper Taylor. 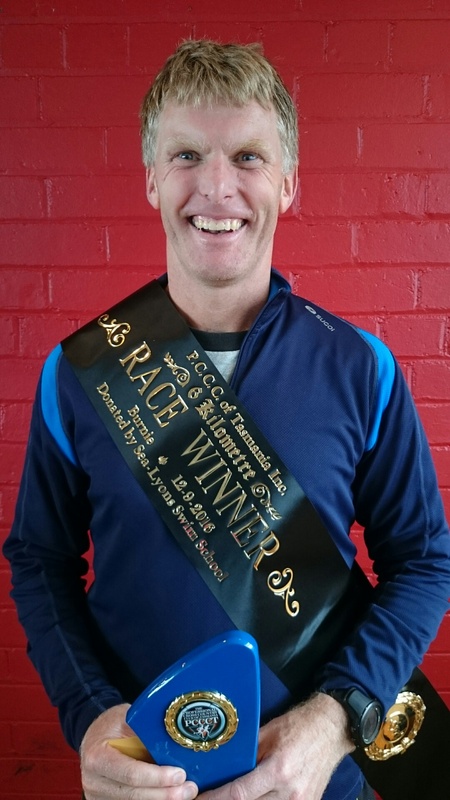 After showing good improvement lately, Somerset runner, Tim Dowling, on Sunday won the Motors 6 kilometre handicap which started at the Penguin motocross track. Dowling had put the writing on the wall with a good fifth two weeks ago in a similar race at Burnie. He said the improvement was due to a special eight week training programme he and his training partner, Louise Morse, had undertaken. It has certainly paid dividends, with Morse finishing a close tenth after being in front with just two kilometres to run. This was Dowling’s first victory with the club, since he joined four years ago. He originally ran in the shorter nominated time events, as, in his words, “I was unable to run even five kilometres”. Now he takes part comfortably in races up to ten kilometres. Continuing his recent run of great form, Ricky Brown was a close second with Chris Purton. having his best finish for the year, next across the line. Other top runs were turned in by Liz Murton and Barry Ling with Thomas Wilson an excellent 11th from a back mark. Wilson was also fastest male (20:51) with Bec O’Garey (24:35) fastest female. Nominated time winners were Laura and Annette Wilson, Jennifer Fuller and Brian Payne. .The AJL Heavy Equipment Half Marathon was run in perfect conditions on Sunday. The out-and-back course from West Ulverstone to Turners Beach produced some great efforts from Club members with none better than that of Wynyard architect, Anna Murton. 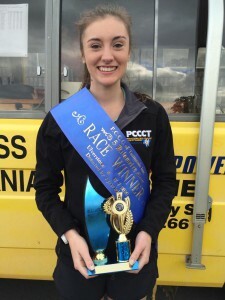 Murton had been threatening to win a race for some time and was thrilled to finally break through for her first win in her fourth year of running with the club. 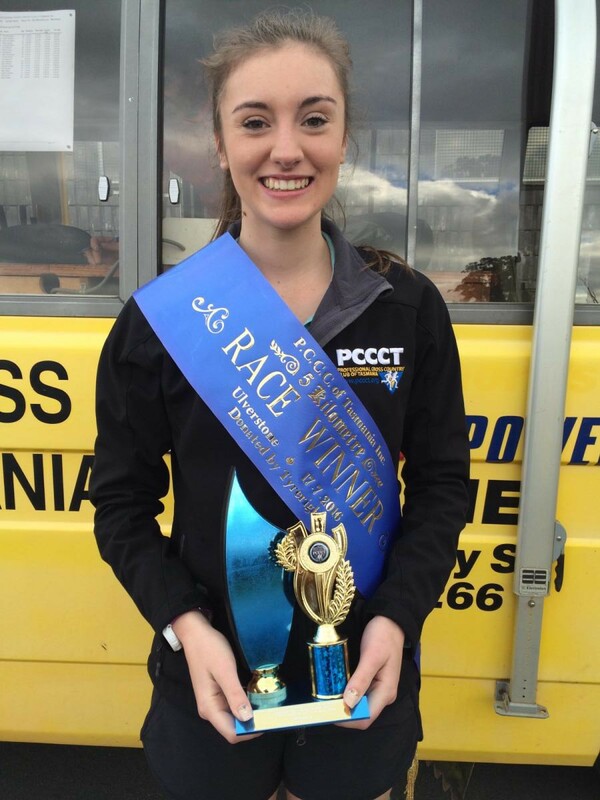 After taking the lead from her mother, Liz, at the 17 kilometre mark, Purton was never headed and won in a time a touch slower than she had set for herself. Together with her father, David, she trains three or four times a week, usually by walking and running with a pack of five greyhounds that are family pets. Excellent performances from Adrian Lakeland and Patrick McMullen saw them take out the second and third places respectively. John Saltmarsh also ran an excellent race to finish in eighth position. Fastest time for the men was recorded by Ben Hoare (1:17:58) while Danielle Mitchell was the fastest woman (1:31:37). 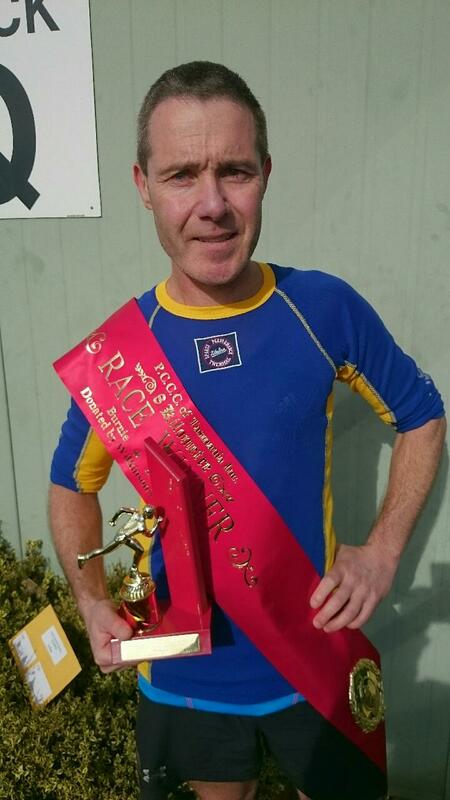 Earlier, the nominated time races were won by John Purton, Tali Brown. Quinn Aitken and Lachlan Purton. 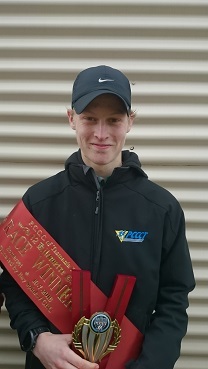 Wynyard runner, Isaac Troughton, won his second race for the year when he took out the West Park Grove Store/Big Six 6 kilometre handicap at Burnie on Sunday. 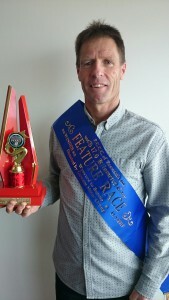 Despite a tougher handicap because of his win in another 6 kilometre race at Devonport just eight weeks ago, Troughton was able to break the tape first due to the improvement he has made. He attributes this to the quality training he has been doing with a strong group of young members, under the guidance of Club champion Thomas Murton. It is very unusual for runners to win again the same season after a re-handicap, but Troughton is in his first season and being young – he is just 21 – great improvement can be made. The race is conducted over a circuit course from the Howe St Netball Centre and includes a run up the steep Brickport Road hill. Front marker Louise Morse showed a return to form leading for much of the journey, only being caught by Troughton and then Matthew Greenhill in the last 100 metres. Other excellent performances were recorded by John Castledine, Tim Dowling and, off a front mark, Rebecca Marien. Fastest times for men and women were recorded by Bryan Tuit and Rebecca O’Garey respectively. Earlier, nominated time winners were Jennifer Fuller, Trinity Luttrell and Conor and Dominic Purton. Perfect weather conditions for running greeted the 83 starters who lined up for the 2016 Gowans Motor Group Wynyard to Burnie Feature Race on Sunday. Go marker Liane Hanson set off on the 17.6km journey from outside the Wynyard Post Office at 9:30 with backmarker, Thomas Murton, starting his quest for victory almost an hour later. The general belief in the PCCCT is that the race starts to get serious once the Cam River has been crossed at Somerset. At this stage 12km has been completed and the main contenders are becoming known. At this stage on Sunday, frontmarker Sarah Hiller was still going strongly in front with David Murton, John Castledine and Stuart Wilson chasing hard. Ben Hoare, who had started from the third back mark of 54:40 was looking the best chance of the backmarkers. Of the middlemarkers, Dwayne Barry and Adrian Lakeland who started from the same handicap, were running strongly but just behind them race favourite Mark Saint-John was looming ominously. As West Park was approached, Lakeland had taken the lead only to be caught shortly after by Saint-John. The two then had a titanic struggle over the final kilometre with Saint-John prevailing by just 4 seconds with the fast-finishing Ben Hoare running into third a further 18 seconds back. Dwayne Barry and Andrew Winkel rounded out the top five with Sarah Hiller hanging on well for seventh to be first female to finish. Fastest male was Thomas Murton (tenth, 60:34) while Danielle Mitchell (fifteenth, 74:42) was fastest woman. Saint-John, a teacher at Burnie High School, was exhausted when he finished, having given it his all, but was thrilled to win, having finished second six years ago. His wife, Lyn had become the first (and still only) woman to win the race when she was first across the line the following year. They are now the first husband/wife combination to have both won the race. 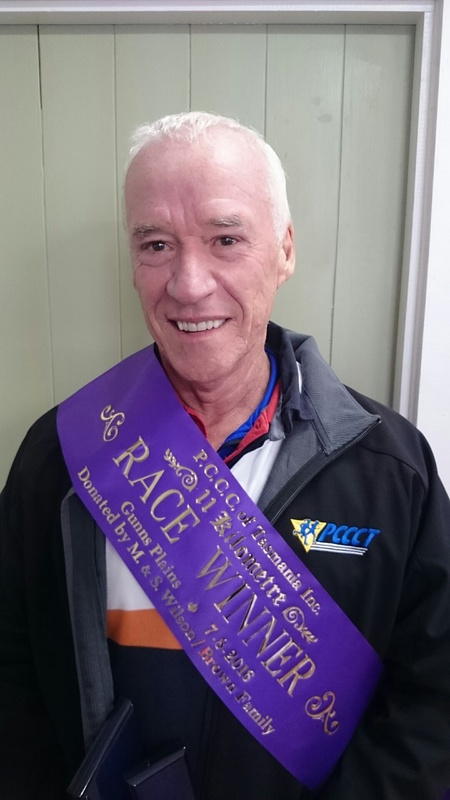 A member of the PCCCT committee, Saint-John is a popular clubman and his win was very well received. Burnie runner, Peter Elphinstone, is a prolific winner with the PCCCT. 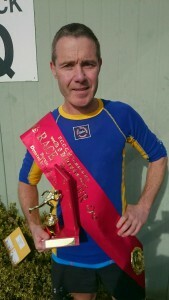 On Sunday he clocked up his eleventh win in the almost 500 runs he has had with the Club since his first race in 1986. His previous win was an 8 kilometre handicap at Fernglade in 2014. 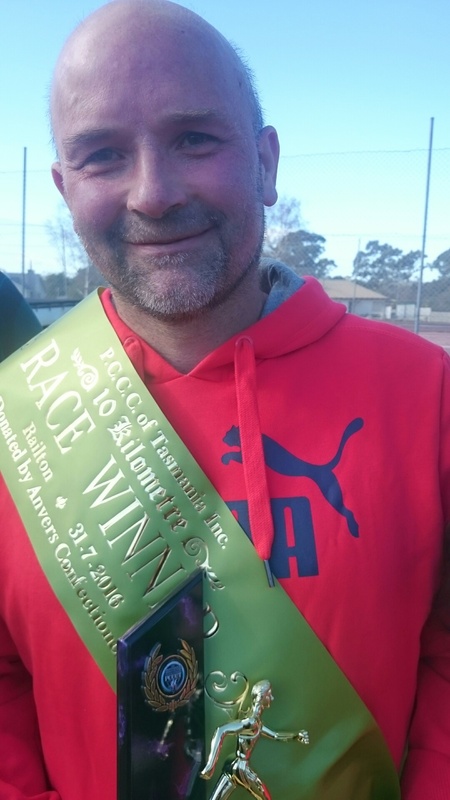 His latest win came in the Brown Family/ Wilson Petroleum Ken Burn Memorial 11 kilometre handicap at Gunns Plains. He credits his success to consistent and varied training with a group of athletes under the watch of Burnie trainer Les Naunton. Cool but calm conditions greeted the 65 runners who undertook the flat out-and-back course. Frontmarkers, Maggie Prescott, Halina Loudon and Liz Murton led until the final 3 kilometres when Ricky Brown took over the lead. He was then overtaken by the eventual winner before hanging on for sixth. In an ominous sign for the Feature Race next week, Brad Taylor stormed home from a backmark into second, edging out Dwayne Barry and the very consistent Mark Saint-John. Adrian Lakeland was an excellent fifth with race favourite Matthew Greenhill in seventh. Earlier the nominated time winners were Isabelle Murchie, Rebecca Taylor and Will van Rooyen. 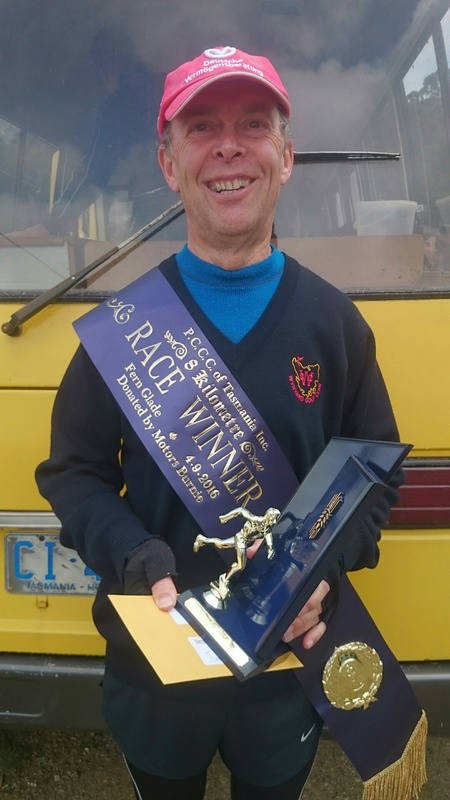 Cheered on by his family, Burnie runner Ken Troughton broke through for a well-deserved win in the Anvers Confectionery 10 kilometre handicap at Railton on Sunday. Run over a picturesque circuit course starting and finishing at Goliath Park, the runners have to deal with one difficult climb at the 4 kilometre mark before a fast descent to the finish. Troughton had been close to a win on multiple occasions recently and was thrilled to finally have the monkey off his back. This is Troughton’s second season with the club and his first win. He took up running on the recommendation of his masseur, Neville Sweetman, also a club member, at the beginning of last year and has made great improvement culminating in this win. Like many members, Troughton’s family run with the club as well – either in the main race or the nominated time events. His two nephews, Ewan and Isaac have also won races this year. Chasing him home were Lachlan Barry and Ricky Brown who ran his best race of the year. Both runners now loom as great chances for a win in the next couple of weeks. Peter Elphinstone and Alan Bakes continued their consistent form to fill the next two placings. Earlier the nominated time winners were Catherine Greenhill, Robyn Luttrell and Mary-Lou Troughton. 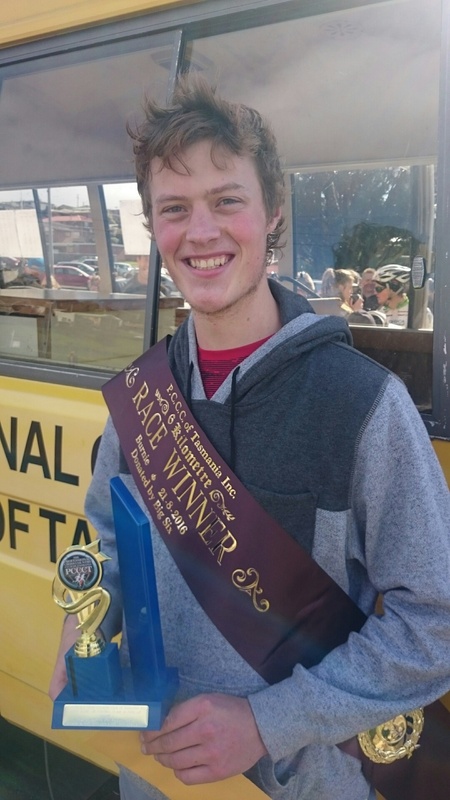 A hilly, slippery course in parklands at the rear of Hellyer College didn’t prevent Smithton runner, Aaron Robertson, from an excellent win in the Professional Cross Country Club of Tasmania’s 5 kilometre handicap on Sunday. Robertson was delighted with the victory which comes in his third season back running after an enforced 8 year lay-off due to a persistent injury. He kept fit during that time with cycling and still cycles regularly as part of his training. He had won one race previously, in 2003, at Sisters Beach and after taking the lead with only 200 metres to run, hung on to beat Mark Saint-John and Brad Taylor. A gallant Ken Troughton, who must have thought he had the race won until Robertson swept past, finished fourth. Troughton had lost about half a minute early in the race after missing a turn and must be considered very unlucky. The course conditions provided a challenge and for many runners the main battle was to stay upright. However, it was enjoyed by most as a break from running on hard surfaces. Tim Dowling and Tony Wilson ran excellent races to finish seventh and ninth respectively. Fastest time for the males was recorded by Brad Taylor (20:03) with Michelle D’Monte fastest female in 25:06. Earlier the nominated time winners were Isabelle Murchie, Ashley Fehlberg, Lucy van Rooyen and Brian Paine. 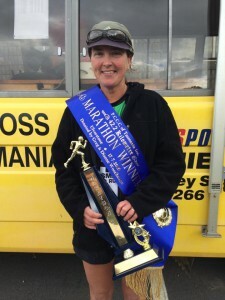 A trip from Hobart proved very worthwhile for Colleen Denne when she took out the G & D Woodhouse Marathon handicap on Sunday. Although she has been a runner all her life, it is only in recent years that Denne has run competitively. She prefers longer distances and this is the fourth marathon she has completed. 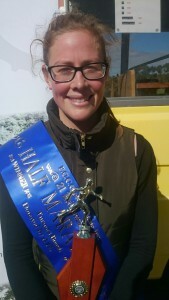 She also came up to run in last year’s PCCCT marathon, and was pleased to improve her time by 15 minutes. This enabled her beat a gallant Amy Bramich by just 2:58 with Anna Murton completing a clean sweep for the female runners. Anna also improved her best time by 15 minutes. Thomas Murton was fourth, running the fastest time of 2:31:52. Fastest female was Sally Haynes. The course took runners from River Park at Ulverstone to Turners Beach and back twice. Other members to improve their previous times included Ellen Elphinstone, Kelly Baxter and Ewen Troughton. The Tyreright 5 kilometre handicap was run in conjunction with the marathon, for those not wishing to tackle the classic 42.195 kilometre distance. This was won by Maddi Baxter who was excited to finally breakthrough. A grade 12 student, Baxter trains 5 days a week with an earlier winner this year, Kate Hawley. She took the lead at the halfway mark and then was never seriously challenged. Second was Ken Troughton with Andrew Aichberger third. Earlier the nominated time winners were Jennifer Fuller, Phoebe Gillard and Lachlan Riley. In his third year with the club and after several seconds, along with other close-up finishes, Wynyard runner Thomas Wilson was delighted to finally break through for a win on Sunday. It came in the Raymond Spinks/CRC 12 kilometre handicap at Somerset. The hilly course commences with a 4 kilometre climb up the Murchison Highway before returning via Village Lane and Seabrook Road. The modest Wilson (19) attributed club champion, Thomas Murton, for pushing him in training for his great recent form but there is no doubt he has worked hard for his win and deserves full credit. Starting from a back mark, Thomas hit the lead with less than a kilometre to run, overtaking a gallant Alan Bakes with Murton finishing hard for third. A great run from Dwayne Barry saw him finish fourth while Adrian Lakeland had his best result for the year with his fifth. Other runners to show good form included Matthew Atkins and Lachlan Barry. Kelly Baxter was first female to finish, coming in eighth. She was second behind Bakes for most of the run down Seabrook Road and a win is close. Fastest male was Murton (41:23) with Sally Haynes fastest female (55:13). Earlier the winners in the nominated time events were Nat Luttrell, Phoebe Gillard, Ashley Fehlberg and Ryan Cahill.